How often do we look outside of ourselves to know what to do? How often do we doubt ourselves and look to others to find a solution to a problem? How often do we seek the opinions of others to feel like we’re on the right path? This weeks episode is about learning how to find the wisdom in yourself. 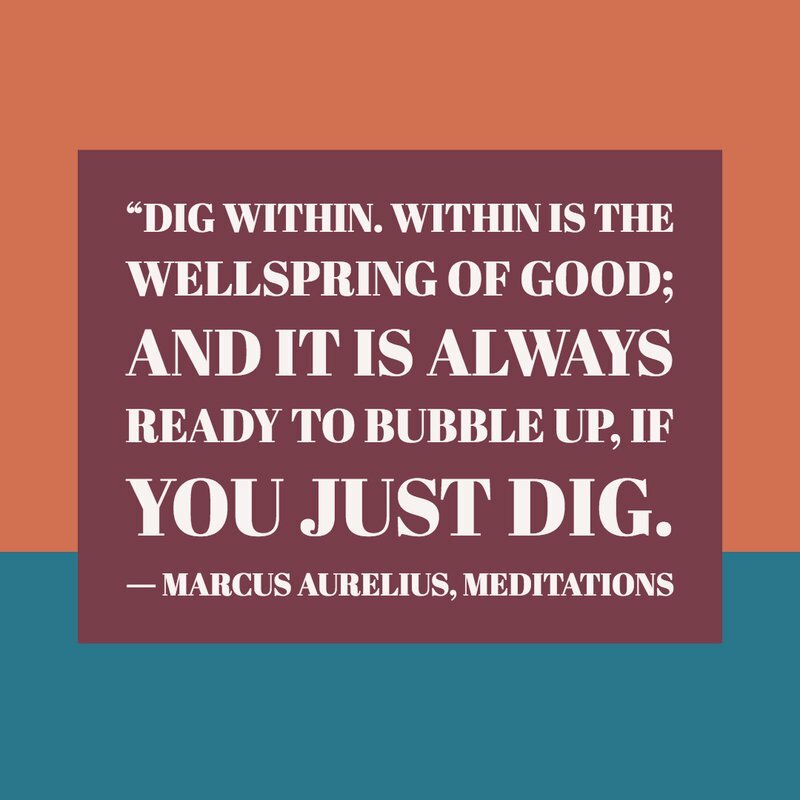 “Dig within. Within is the wellspring of Good; and it is always ready to bubble up, if you just dig. The culture that we grow up in can have a huge impact on us as to how we view the world. If we’re lucky, we have parents, teachers, and friends that teach us how to listen to our own voice and know what we feel, and what is right for us. Many of us don’t get taught these lessons of self-reliance and self-confidence. We’re taught to please our parents, please our teacher, please our church leaders. Paying attention to what we feel and what we know is right for us is highly discouraged, or at the least given little attention. We grow up relying on the opinions of others to know what we should be doing. We look to see what kinds of relationships we should have. If and when we should get married. What kinds of jobs we should take. What kinds of shows to watch on Netflix. The thing is, society doesn’t want you to stop and think for yourself. People who take the time to truly know themselves, are no longer easy to control. They are not easily manipulated. They are often poor consumers because they know what they want and don’t waste time or money on things they don’t. In my case, the church taught me what I was supposed to want. So much of my life was wrapped up in pleasing the leaders and the members of my church. So much so, that I often didn’t know what I really wanted, or how I really felt about things. Even as a grown man, I often find it difficult to know what I really think or feel in a given situation. When I’m working through what I want in my life, I will find myself looking for the right answer outside of myself because I don’t think that my own opinion is worth anything. I don’t trust that I’m smart enough to figure it out on my own, or that I have the right to decide what I want. To think for myself and do what is right for me, rather than what I think others think is the right thing. To listen to yourself, to recognize your own wisdom is a scary thing because it means that you are responsible for the results you get. You are responsible for all your failures. You are blazing your own path, rather than parroting what someone else does. You are claiming your life as your own. It’s also hard because when you decide what you really want to go after, it’s really scary to think that you might not get it. Often you choose someone else’s dream because if you fail, then it’s not that big of a deal. What does Epictetus mean by we can’t be defeated? If we only measure success by the things that we can control, we can never lose. We should never measure success based off of something that we can’t control, in this case gaining a powerful position. He also warns us not to be fooled by what others have because they may not be happier. This means that we should not define our happiness based on what others think is successful. For example, if I measure the success of my podcast based on how many people are listening, then I will always lose. But if my measure of success is that I put out an episode each week that is important to me, then I am successful. If I feel like I’m improving, that I’m growing personally, then I’m successful. Epictetus reminds us that if we do our best to be rational, to act on the things that we have control over and let go of the rest then we will find the good inside of us because we will see no need for jealousy or envy because we pursue what we deem as good and important. When we care less about the opinions of others, then we are free from all stress and striving and competition. We don’t care what others think so we do things that are good for us, not what others think we should do, and this is where true freedom lies. Learning to listen to and trust yourself, and to think critically is a very important part of living a good life. It means that we learn to let go of what everyone else thinks is good for us, and we act on the things that we have control over, and trust that if we do our best, to be honest with ourselves we’ll make good choices. We may make mistakes from time to time, and we’ll fail, but we’ll learn and we’ll grow, and we’ll be free because we are living the life of our choosing, not someone else’s.